Last edited by nofish; 03-12-2019 at 10:51 AM. Ah .. does the media item have a start offset (nonzero start in source) in all of these cases? ... should be fixed now! Last edited by schwa; 03-12-2019 at 09:40 AM. Thanks for reverting the mouse modifier - it is really great now, I would say! Last edited by EvilDragon; 03-12-2019 at 10:09 AM. Still getting this crash when trying to edit text in non-active item. I am using notation in continuous view with multiple items visible. It does not crash each time, usually several tries are necessary. Could it be related: https://forum.cockos.com/showthread.php?p=2106830 ? Ovnis the bughunter is back ! Let me add to this. I know that there's the option to "Edit previous note within current grid division", but this is not good enough. This option should not depend on grid division IMHO, it should just use the whole space between the current event and the next event. Why? Say we have grid set to 1/4, but your note event is close to the end of a beat. This option is useless then, because you can only use what little is left until the next 1/4 grid division happens - this is not a relative edit, so it's not 1/4 FROM the note event. It would be a good idea to have a "Mouse modifier/MIDI CC segment/Insert CC evendt, drag to move" which behaves exaclty like "Mouse modifier/Envelope segment/Insert Envelope point, drag to move". Actually, when we insert a new MIDI CC point, it will not always create a new point on the existing segment without modified it. It would be nice to be able to always see the MIDI CC envelopes (even if there is no envelope point). 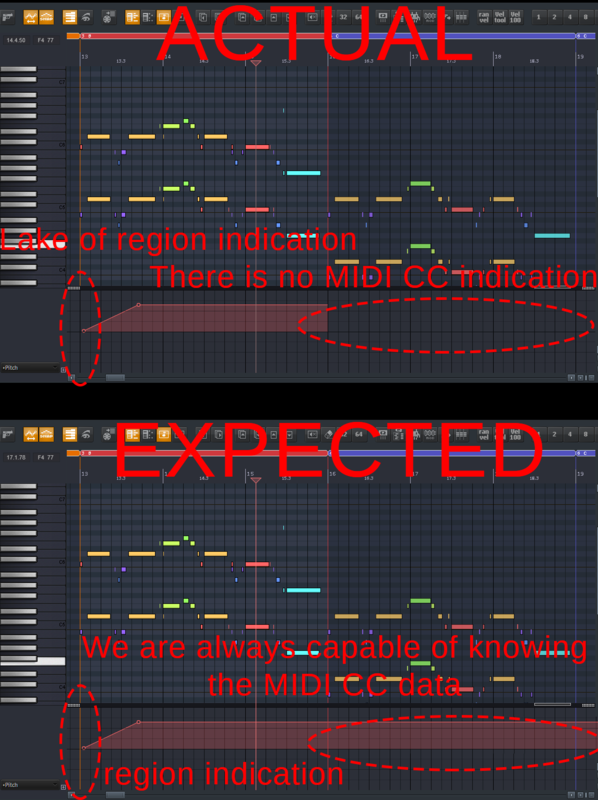 We should be able to always know the MIDI CC data and in the case of the pitch envelope, it would be easy to create pitch point at 0. Yes to that, but definitely should be more transparent when outside of MIDI item, maybe? The eraser zone is not accurate. When I try to delete one point, an another point is deleted. It seems that CC shapes cannot yet be set for any of the LSB lanes (32 - 63). Even if a shape is set for a 14-bit CCs, the LSB part remains square. EDIT: If the LSB CCs contribute to smooth ramps of 14bit CCs, their values will not also be a smooth ramp, and will instead be a messy zigzag, so perhaps it is better to exclude them from 14bit CC ramps. This does mean, however, that 14bit CC ramps are not as hi-res as users might expect. The new API functions work perfectly for most of the new CC shapes -- except that Bézier tension does not seem to be included yet. Last edited by juliansader; 03-13-2019 at 09:54 AM. I'm thinking about this from sometime now. It would be nice to have the option to show envelope value visible on the points of the envelope, like some kind of label. I'm thinking about something like this for example. Having some issues with the CC envelopes. I'm using a script to trigger a JSFX into sending CC values. Before with the old bar CC's - if I adjusted my CC slider in my script - if I leave it a few seconds on one value - then change the value - you get the expected change where the value stays the same until it gets the new value (square shape). With the new envelopes - I end up with a long slope between the last CC value captured and the current one (a few seconds later) triggered via the slider. I have checked that the option for default CC shape for new CC events is set to square. For me, it should be better if the label appears only when the mouse cursor is above the point. Channel pressure seems to interpolate fine now. And the LSB issue with pitch bend is fixed as far as I can tell, it sounds as played now . Recorded CC events will still be set to linear although default shape is square. I don't think that's good, it at least should be optional. CC64 Sustain pedal has special handling. It always gets recorded as square events (which is ok with me) but it lacks the curve settings in event properties, so we won't be able to use the new CC curves with instruments which allow for smooth pedalling. We must use the old many-events method for these. I understand the convenience for the majority of use cases with CC64, but it feels very restrictive. After all, CC64 is just another controller number which could control anything. CC64 should NOT use only square shape. There are piano plugins which can recognize continous sustain pedal, which means not only "square" changes. Yep. Don't get me wrong, they still get recorded in full resolution as before and you can still edit the old way. But they don't benefit from the new curves. This is the "Envelopes for track x" window? Can we get an option for "Show automated FX parameters only", please? - Where I click horizontally will determine the last event that will move at all. All events to the right will be ignored. - Where I click vertically will determine the value of the last affected event if I happen to drag further right. "Edit selected CC if any, otherwise draw/edit ignoring snap" will additionally refuse to draw new events when no CC are selected. No, that is for "Param" button in FX window header. hmm-if it's a toggle then a toggle it is--is'nt this why there is also a soft pedal cc for that? it depends on how the plugin makers make these things to begin--some are remapable-some are hard coded toggles..so..
just hope this gets done 'right'...especially with midi2 just around the corner..are cockos onboard yet? CC 64 is not a toggle. In some (most) virtual instruments the sustain pedal parameter is a toggle, but the CC is a fully fledged 7bit CC message and it should be possible to handle it as such. There is no reason why it should not benefit from the new features as well. It is a commonly used articulation on a piano to hold the sustain pedal at different amounts between not pressed and full down, to keep a touch of the dampers on the strings. And you can press or lift it rather slow instead of in an instant. As said, some plugins support it, most don't. Plus you could also want to control any other device and parameter, maybe the intensity of a stage light, heat of your toaster or even a filter cutoff frequency. Soft pedal is a completely different thing. Last edited by gofer; 03-13-2019 at 03:43 PM. heh- subservient infos ... i think reason does well with it all..as it uses both types of bars+curves...that is all. + it does'nt confuse the crap outta users as it's fairly logical in practice. before using reaper-- had never come across a note off velocity lane anywhere?? what's the purpose of it? it's either on or off_no ? ...seems daft to me--but i am daft.. but not daft enough to find an actual use for it tbh..
+ have no need to control a toaster with or without cc-how many controllers does 1 actually need in practice?- if it's for lighting setups etc--surely that's all handled per channel_per lane? reaper makes a lot of sense imo-but a whole load of nonsense as well..imo. Î can't find a translation for "subservant", what does it mean? Edit: Ah, subservient, got it, but what are you saying with it? Off velocity is very useful. For example you can let kontakt play the release sample with this velocity. IOW, you can have a soft release sound triggered when you lift the finger slowly, and something completely different when you lift it fast. Last edited by gofer; 03-13-2019 at 04:10 PM. Did you mention something about a script running too? I did but I got also crashes when it was not running. It seems to be solved in the current 5.973+dev0313 though. Guys, what's up with envelope transition time when recording? I don't get the 1 ms value I am using everywhere when recording automation from boolean controls (buttons, switches). That doesn't look like 1 ms transition time to me. I get this with a bunch of plugins, so it doesn't seem to be plugin-specific. Or is this "transition time" supposed to be something else entirely - please feel free to correct me if I'm on the wrong train of thought about this! Last edited by EvilDragon; 03-15-2019 at 12:15 AM. Any comments on the above, devs? Anyone? Justin, schwa? Any info about the above? Why isn't the transition time 1 ms as I set it up when automating a button? I'm not sure I agree with this. There is one really handy part of the lollipop type velocities. This allows the user to select only the higher or lower velocity with a marquee selection. That's not possible when the velocities are bars. I agree that the lollipop look isn't quite as visually snazzy as the bars but functionality is great so far. I haven't run into anything that was specifically annoying other than it looking a little different. I mostly use key command actions and the midi editor to adjust groups of velocities. Is there any specific annoying cases you've run into? I'm also not sure I agree that the note length thing from Fruity Loops. If we're wanting to see the notes we look at the notes in the editor, If we want to see the velocities we look at the velocity lane. I personally think it would clutter the velocity lane to have extra length bars added on. I know the Dev team has stated that they don't want to support two different ways for the CC lane to work (blocks or envelopes). I totally understand that as this would be a major overhaul and the envelopes are clearly a superior way of working. The velocity display may be considered more like a visual preference. Similar to note colors. 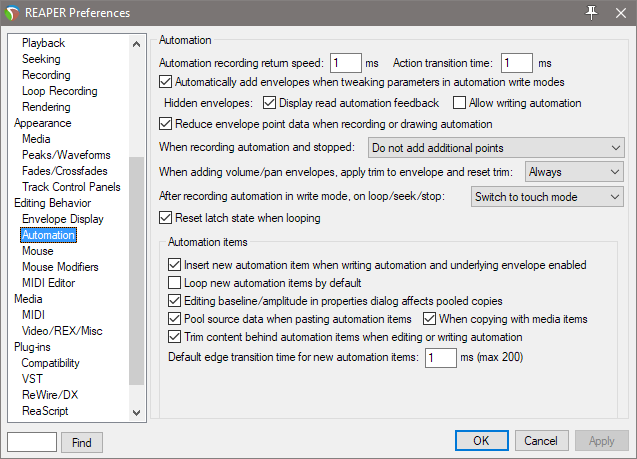 Perhaps a compromise would be that all these additions to the velocity lane should be check box options in preferences or when the user right clicks on the velocity lane. This way people can work either way and it's not as drastic of a change like CC envelopes. Where do you see me arguing that velocities should be bars? Nowhere did I say that. There are certain velocity editing behaviors that are NOT smooth, that's all I'm arguing that should change to be smoother. I even provided GIFs to explain what I mean (in the previous prerelease thread). Ah! My bad. I see your GIFs from the previous thread. Yeah, that could be smoothed out. And once again, please some reply on the above findings regarding automation return time. Am I misunderstanding something there? Why does a click on a button produce such a long ramp, when it's a simple on/off toggle? Last edited by schwa; 03-25-2019 at 07:02 AM.